Hide this Project (Elite Homz) Discover properties in other projects by hiding the ones that doesn't interest you. You won't see them in your searches further but you can unhide anytime later. Hide this Dealer (SBM Properties)Discover properties by other dealers by hiding those whom you have already spoken to. You won't see them in your searches further but you can unhide anytime later. Hide this Dealer (UNIQUE ESTATES)Discover properties by other dealers by hiding those whom you have already spoken to. You won't see them in your searches further but you can unhide anytime later. Hide this Dealer (Sunita Kapoor) Discover properties by other dealers by hiding those whom you have already spoken to. You won't see them in your searches further but you can unhide anytime later. Elite Homz offers beautifully designed 2BHK, 3BHK and 4BHK apartments with inexpensive and contented contemporary features at the leading locale of Sector-77, Noida. It is an exclusive residential project jointly developed by HR Buildcon and Oracle Realtech. The project comprises of a perfect domicile that speaks of an elite lifestyle. It is constructed to give abundant light and air to freely flow in and around the complex. Elite Homz also comes with a competitive price list which is difficult to resist. Elite Homz...first reason, fourth season! Sector 77, Noida is flanked by the Hindon and Yamuna River on either side leaving a beautiful by the side. The Delhi Noida Direct flyway and the Noida-Greater Noida Highway have already made a well-communicated region for the residents of Elite Homz. Sector 77, Noida has some of the finest educational institutes like Kothari International School, Global Indian International School, Sapphire International School, Amity University, Jaypee Institute of Information Technology and FDDI Noida. Shoprix Mall, Spice World Mall, The Great India Place Mall and DLF Mall are located here. In which area is Elite Homz located?The project is situated in Sector-77, Noida. What apartment sizes are available in Elite Homz? The project offers apartments sized between 1115.0 sqft and 2217.0 sqft. What is size of 2 bhk in Elite Homz? 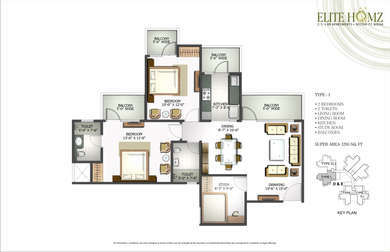 The area of 2 BHK apartments ranges from 1115.0 sqft to 1317.0 sqft. What is size of 3 bhk in Elite Homz? 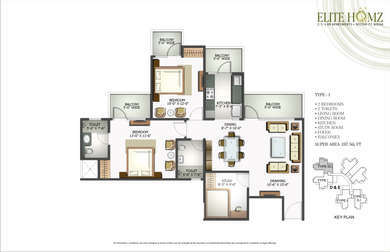 The area of 3 BHK apartments ranges from 1555.0 sqft to 1830.0 sqft. How much is area of 4bhk in Elite Homz? 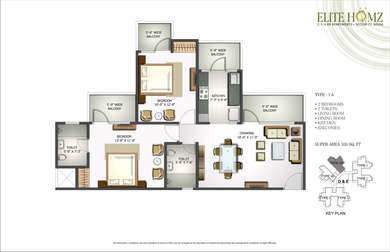 The area of 4BHK units in the project is 2217.0 sqft. What is total size of Elite Homz?The project is built over an area of 5.0 Acres. I am looking for a 3BHK or 4 BHK apartment in sector 77 noida, specifically in Prateek Wisteria or Elite Homz, I can pay anything within 5000 per sq. ft. Please let me know if any owner is willing to sell for the given price. Will be quick deal. Hi Sumit-In Prateek Wisteria a 3BHK and 4BHK unit in the both the projects will cost you at a price ranging from Rs 80 Lakh to Rs 1 Crore. The average prevailing property price in this project is around Rs 5600 per sq ft while the average property price in Elite Homz is around Rs 5400 per sq ft. As per your budget property is not available in both these projects however, if you can increase your budget beyond Rs 5000 per sq ft you can go for either of the projects. Both the projects are equally good. Before finalizing the project you can go for an extensive builder research and consult from the local brokers before taking an informed decision. Mr. M Raj, Please refrain from posting your contact details on AnA Forum as this is against our company policy.